For Bob Byers, a 500-mile trip from his home in Ohio seemed only logical when he learned-just yesterday-that Mike Huckabee would visit the Billy Graham Library. Huckabee, a former governor of Arkansas and Fox News commentator, visited the Library Thursday evening to sign copies of his latest book, God, Guns, Grits and Gravy. "I like Mike Huckabee, and I respect him. It's great to know that as a Christian and a pastor, he would come and do a book signing at the Billy Graham Library. Christians need to come together like this and work together to build up our country," said Byers, who has driven the eight-hour trip to the Library multiple times with family and friends. "So, I just made a quick decision to get up this morning and head down here." Matt Shearer brought a guitar for Huckabee, an accomplished musician, to sign. 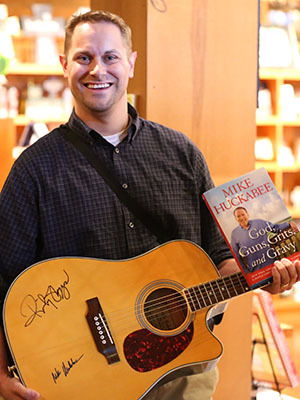 The other signature on the guitar is from Ricky Skaggs, who has shared his music at many Billy Graham Crusades. Later, once Huckabee entered the expansive lobby of the Library to a cheering crowd, Franklin Graham introduced him. Then Huckabee said a few words to those who had come to meet him. When he said the name of the book, someone from the crowd shouted, "Amen!" "It's not a southern recipe book," Huckabee quipped back. "But I hope it encourages you. I hope it challenges you. I hope it wakes you up to some of the ways we are losing our culture." This book, Huckabee said, is a cultural expression he has made on behalf of many Americans. "So many people in America believe that, at the foundation of our culture and civilization, there has to be this understanding that God is the One who makes the rules. We don't get to edit or change them. We either live by them or die of failure to live by them," he explained. And as a believer-who was heavily influenced by the ministry of Billy Graham as a teenager-going on the Journey of Faith tour and meeting others who were influenced by Billy Graham's ministry carries a special significance to him. "This place is really about the message that Billy Graham preached. What's always been so remarkable is that he's always kept it in the lane. He has never got off on the shoulders of the road, because he knows that narrow is the road that leads to life," said Huckabee. "And this Library keeps it in that very narrow lane, pointing people to Christ. It's really a tribute to the Word of God and to the Gospel of Jesus Christ." He recalled the evening at Explo '72, an event where young people came together at the Cotton Bowl in Dallas to learn about and commit to evangelism. One particular moment that left an impression on him was immediately following a talk Billy Graham delivered on being light in a dark world. "To illustrate the power of sharing Light with others, Billy Graham lit the candle of each person next to him, they lit the candles of others, and so on. In a matter of seconds, the entire Cotton Bowl was illuminated with an orange glow. People were calling the Dallas fire department to report that the Cotton Bowl was on fire. And they were right, though it was a different kind of fire," he remembered. "This was the moment when God really began to speak to me. I learned that even just one light in the darkness can make a difference." So for Huckabee, this event was much more than a book signing-it's a time he hopes Light will spread, just like that night in Dallas back in 1972. "One of the things that excites me about this event is that there are people who want to be here, not to just be a part of a book signing, but because they share faith in Christ," he explained. "And if they don't, I hope that being on this campus will cause them to see Something much bigger than themselves."